▶ SoldThis listing was sold on May 1, 2018 for the price shown here. 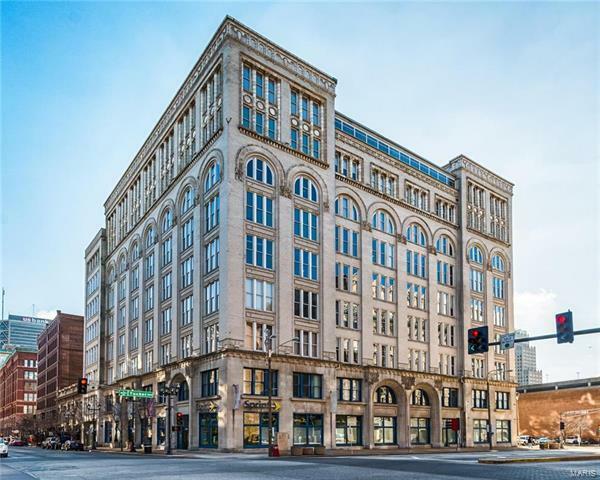 Welcome to Unit #605 in the acclaimed Meridian building on the corner of Tucker and Washington Ave in the trendy Washington Avenue loft district . This 2 bedroom, 2 full bath unit has an incredible open floor plan perfect for entertaining, high ceilings and 1500+ square feet of stylish living space that includes a bonus room. The kitchen has stainless appliances, built-ins, and a prep island. The Master is spacious and its adjoining bath has a separate tub and shower, and modular walk-in closet. And best of all with its tall windows, the unit provides incredible light and one of the best city views looking down exciting Washington Avenue . The unit also comes with one (1) assigned garage parking space. Southeast corner or Washington Avenue & Tucker Blvd. in downtown St. Louis. Just north of 40/64 with easy off at 11th Street and back on at 10th Street.